Ed Babcock, Pomona Valley Audubon Society member, leads a group of bird watchers through the Rancho Santa Ana Botanical Garden on Sunday. This free family bird walk gave people a chance to enjoy nature while looking for different types of migrating birds. / photo by Nikky Huynh. The Pomona Valley Audubon Society hosted its monthly bird walk at Claremont’s Rancho Santa Ana Botanic Garden bright and early Sunday morning. The tour consisted of two groups of around 25 people each. Both groups included members of the Pomona Valley Audubon Society to help identify and find the native birds in the garden. The event attracted cubs scouts, families, students and bird enthusiasts. “I have never really looked at birds this way and it’s a nice and relaxing thing for students to do,” La Verne freshman biology major Frankey Sanchez said. 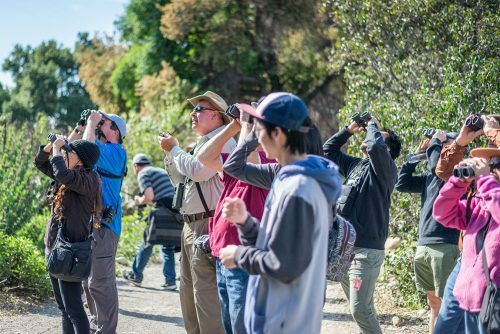 “In a bird walk you like to have people who know the bird calls, kids who can spot out the birds out quickly, and someone with a big camera,” said Ed Babcock, a Pomona Valley Audubon Society member, who helped lead one of the tours. It’s best to bring binoculars, though the Audubon Society provides loaners for first-timers. The gardens attract a wide variety of birds, such as the white-crowned sparrow, a bird with black and white streaking on its head that people can spot in the garden between April and October. Also found in the garden is the American Goldfinch, a small bright yellow bird with black and white wings. “I think the birding community is really cool,” Pitzer College student Carly Dennis said “Everyone I have ever met who enjoys birding is a sweet person and it is a really cute and wholesome activity,” said Dennis, who is originally from Alaska. She said her mother enjoys bird watching so she decided to check out the Botanical Gardens and learn about California’s native plants and birds. “Not a lot of students know about this garden,” said Alyssa Cruz, a ULV junior speech communications major. The Pomona Valley Audubon Society offers free bird walks throughout the month in several locations that can be found online at pomonavalleyaudubon.org. “It is an opportunity to see the birds and have your consciousness raised while being out in nature,” Pomona Valley Audubon Society member Gloria Slosberg said. The bird walks help promote the protection of wildlife. The Botanical Garden has these bird walks every first Sunday and third Saturday of the month. Maydeen Merino can be reached at maydeen.merino@laverne.edu.